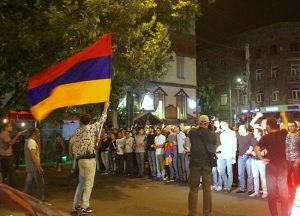 On 17 July 2016 an armed group of representatives of the opposition group “Daredevils of Sassoun” occupied Erebuni district police station in southern Yerevan, killing one police officer in the process before calling on Armenians take to the streets to secure the release of jailed opposition politicians. The peaceful protest subsequently organized by Armenian citizens demonstrated their support of the group as well as their discontent with the political leadership of the country. Between 2000 – 3000 protestors participated in demonstrations on peak days. Responding to allegations about human rights violations that were being committed in the context of the events, on 28 July 2016 the Civic Solidarity Platform (CSP) deployed a fact finding mission to Yerevan. The purpose of the mission was to study allegations concerning the use of disproportionate and excessive force in relation to peaceful demonstrations; arbitrary detentions; abusive treatment of demonstrators and journalists, as well as other human rights violations. Forty-two victims and witnesses gave testimonies to the team of monitors during the mission, which ended on 1 August 2016. Download the report on preliminary findings of the fact-finding mission. A more detailed report is forthcoming. Note: On 30 July 2016 the “Daredevils of Sassoun” surrendered after reaching an agreement with Armenian authorities.